Saturdays are the perfect day for children and families to explore WMA together! A free come-and-go art activity for kids of all ages is offered the first Saturday of every month. All supplies are provided and no pre-registration is required. Each First Saturday will feature a different project. Special additional activities included some Saturdays. Gallery and garden activities are available, too! Call the museum at 334-794-3871 or email education@wiregrassmuseum.org more information. Come up to the studio to create a watercolor cityscape! Using markers and watercolors, guests will be able to create their own vibrant cityscape. 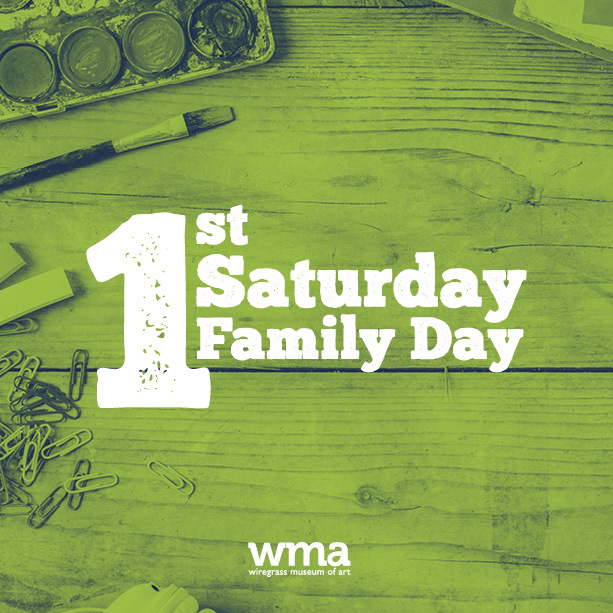 Join us in the Main Gallery for an another opportunity to create at April 6th’s First Saturday Family Day! You will be able to make a unique design on a fabric square that will be added to a community quilt! This quilt will be assembled and put on display in the galleries in June. Come into the studio to create your own circle weaving sun! After drawing a face for your sun, you will add colorful rays with layers of yarn. Come up to the studio and create your own pointillism masterpiece! You’ll fill in your work of art with vibrant dots using a Q-tip. First Saturday Family Day activities are made possible by the Wells Fargo Foundation.